Netflow is a network protocol used for accounting the IP network traffic. It was developed by Cisco Systems. Now it is actually the industrial standard, it is supported by many devices. There are several versions of the protocol, but the most common are the versions 5 and 9. The Sensor that collects statistics about the network traffic passing through it. Usually it is switch or router. The Collector that collects coming from a sensor data and puts them to the storage. The Analyzer that analyzes the collected data and forms the reports a suitable person read reports (often in the form of diagrams). 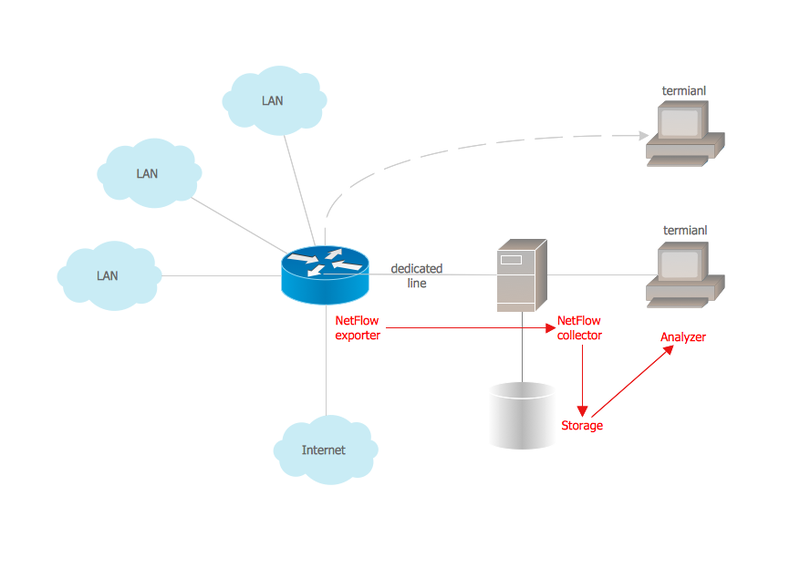 This diagram was created in ConceptDraw DIAGRAM using the Computer and Networks Area of ConceptDraw Solution Park and shows the Netflow architecture. Using the solutions of the Computer and Networks Area for ConceptDraw DIAGRAM you can create your own computer network diagrams quick and easy.